It is, unquestionably, an inappropriate time for this type of expenditure. Someone, surely, should have recognised that? 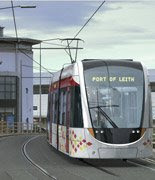 ... the very fact that it's made its way into an official Council report just about sums up the political miasma that appears to be suffocating all prospect of decent decision-making within the City Chambers at the moment. Very busy few days ahead, with the Forth Ward by-election now less than a week away! Edinburgh University (for the second time in one day!) this evening for a Student Forum event ... organised by Edinburgh University Students' Association (EUSA). Enjoyable evening, with good contributions on a wide range of topics. 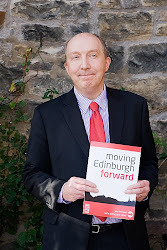 ... that's not to say there will 'always' be agreement - but there's a sense of an open-dialogue now happening, which I'm certain will help understanding from all sides of the debates which surround student communities in Edinburgh. This afternoon, helped out with a lecture session for Edinburgh University Law Diploma students - been something I've assisted with for around 5 years now ... on a course run by Council staff from the Committee Services section. I'm personally astounded at the story (BBC link here) being covered today about the Catholic churches' comments on the Embryology Bill currently going through the UK Parliament. ... frankly, they are quite simply wrong on this. There seems to be an almost complete blind-spot (when it comes to certain Catholic church representatives) to the fact that a huge percentage of female eggs are lost in the natural process of conception anyway? Council News Release out today, which reads to me like the beginning of a 'softening up' process before the 2009/10 budget round commences properly in a few weeks time - BBC have also covered the story here. Its all well-and-good to blame some of the current local, financial difficulties on the 'credit crunch' ... but I'm certain all the Opposition Groups on the Council will be looking at the forthcoming budget detail very, very carefully. ... 'credit crunch' or not, I'm fairly certain the financial challenges within several Council Departments are still causing their own problems, precious little of which has been solved since last May - despite all the promises to the contrary? A banquet for our times? ... so, I'll reserve my judgement until I know who is paying for year 2 - as its not at all clear that funding is secured beyond the first year for this event, which is being paid for by an anonymous benefactor?? New, electronic Newsletter been launched today for the Council's Children and Families Department - official blurb from the launch can be found here ... and the first edition itself can be found here. ... on the face of it (sorry, couldn't resist that!) I reckon this innovation has decent potential and is a good development. "Improving our school estate is one of Edinburgh's priorities and in recent years there has been a huge investment in our school buildings. We are committed to continuing with this investment and a number of construction programmes are currently taking place in the city." Slight failure to mention that NOT ONE construction programme has been initiated in the last 18-months and that come early 2010, when the current second-round of the school building programme is finished, there is nothing to follow it. To be fair, the rest of the Newsletter content is fairly informational - as opposed to the 'aspirational' quoted above! Spent a lot of today up in the Forth Ward ... by-election now only 11-days away! ... weather still not that great mind you - certainly hope it's a bit drier on Thursday 6th November! ... you would think being in Opposition would have led to a reduction in the volume of incoming e-mails, but no - if anything there seems to be a never-ending increase in the sheer scale of e-mail traffic that comes my way! I dread to imagine what it will be like when the remaining 30% (or so) of local households get direct access to a computer?? 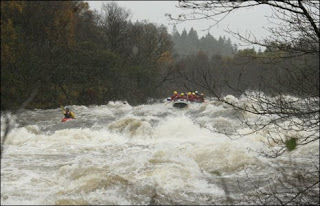 This picture of the River Orchy in spate just about sums it all up! 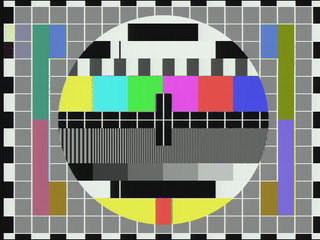 Normal service will be resumed very shortly. ... just cannot see any way back from such a poll deficit, across so many states. As usual, Steve Bell pretty much sums it all up in today's Guardian - its all in their "cartoon-persona's" body language! So close to the truth. 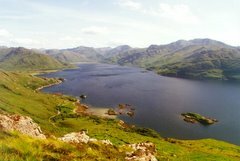 The Lord Provost did verbally guarantee that the whole saga would come back before the Full Council after the Standards Commission has duly reported. ... it can be done, but precious little evidence of it yesterday unfortunately. ... there are actually quite a few substantial items on the agenda and I suspect there will be more political divisions this month, than in the last few meetings? ... have a look at this article in today's New York Times - and do take note that it is written by a man who has just, this very day, won the Nobel Memorial Prize in Economic Sciences. 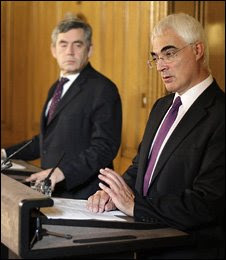 Gordon, and Alistair, do good? 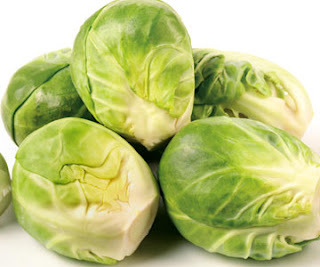 ... managed to fit in an early Sunday evening visit to the allotment and picked a few of the still-growing brussel sprouts, took them home, and cooked them as part of our Sunday dinner. 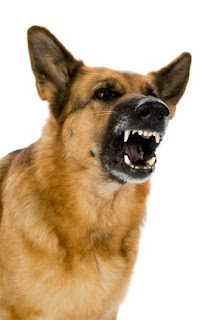 ... but all was okay really, as the owner followed the dog out, just as I was exiting the gate at close to 100mph, and told me not to worry as the dog wouldn't have touched me as it was trained to bark only?? No more passing the buck? I do believe COSLA have just put out a News Release (this afternoon) whose content is very, very significant. It follows their 'Leaders' meeting earlier this morning when they discussed the collapse of Icelandic banks ... the News Release mainly deals with this issue, and this is obviously what the BBC have picked up on. BUT - have a look at the last three paragraphs on 'school meals' ... the last paragraph, in particular, is code for 'We may have signed up for the school meals commitment, but we now believe we don't have the money to implement it and want to renegotiate the deal'. 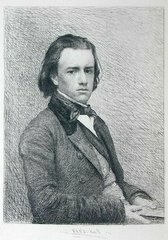 And do have a quick read at paragraph 4, on page 6, here ... escape hatch or warm words? ... so, it is obviously noteworthy that he has an opinion-piece in today's Guardian that applauds yesterdays actions by the Treasury. North Merchiston Football Club (in the Fountainbridge area of the Ward) became only the fourth club in Edinburgh to attain the Scottish FA Standard Quality Mark Award today! ... think all the details should be up on this website very soon. I know that a huge amount of effort goes into the successful running of this local club and I was really delighted to learn that all the hard work which goes on behind-the-scenes has been recognised with this Award. Well, at least 'something' appears to be happening ... even if it is nearly a week since all the problems began! ... I still can't help wondering just what on earth the Convener of Transport is doing - other than keeping absolutely silent on all of this, that is? 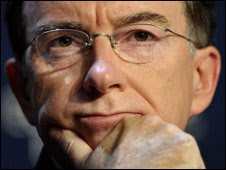 Who would have thought it - Peter Mandelson back in the UK Cabinet? Of course, it was all complete coincidence! 'Big Brother' enters the by-election!? 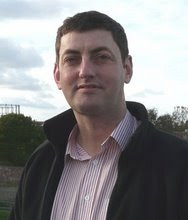 ... actually, its not as bizarre as it sounds - John Loughton, who hails from that part of the city, and who did indeed win Big Brother back in January, is said to be launching a local campaign this coming Monday at the West Pilton Neighbourhood Centre? So, if John does stand as an Independent ... that'll make at least 8 candidates I reckon - and probably more to come?? ... on a brighter note! ... on a slightly brighter note than my last couple of posts - some apparent good news from the COSLA/ Unison negotiations this evening! 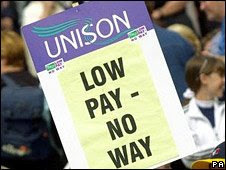 Appears that an improved offer HAS now been made, and the third round of strike action - which was penciled in for next week - has been suspended whilst consultation with Union Members takes place. I had been of the view that the original 2.5% offered could be improved - and, without pre-judging what Union Members conclude, I'm glad it now has been. 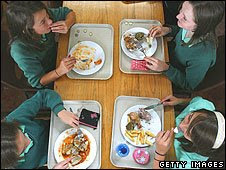 'Free school meals' - at no cost? "However, the government will not be allocating extra money to fund the roll-out of the initiative." No extra money - we, in Scotland's Local Authorities, have got all the cash we're going to get and we dutifully signed up to all of this in that 'historical concordat' - go on, check out those specified commitments on page 4 and 5 here. "The rest of the "specified set of commitments", and the fact that they are practically all unfunded, make very, very worrying reading financially..."
Those who signed that concordat, and those who have since remained silent on it, frankly have a lot of serious questions to ask themselves. Local Government in Scotland HAS been emasculated and - mark my words - will subsequently be blamed for all the 'political ills of Scotland' come late 2010/early 2011. The Political Party of "Independence" has indeed removed that very same thing from the tier of Government they control and democracy is the weaker for it. ... and, of course, you simply cannot ignore the small matter of money to pay for all of this at a local level? 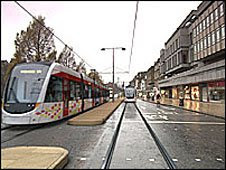 ... today's Scotsman has a brief piece on the near complete gridlock that was the City Centre yesterday, which was a result of the start of tram works at The Mound - you can read the article here. "Despite the extent of the problems, the city council declined to comment on how the first day of the tram works had gone." Thousands - no, probably tens of thousands - of commuters were affected by this yesterday and not one word from any Lib-Dem politician currently in charge of this project. 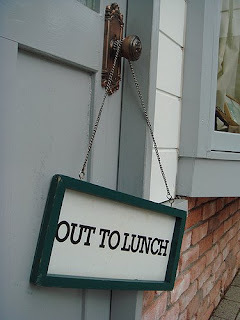 In my darker (and generally uncharacteristic) moments of feeling 'less-than-charitable', I sometimes think the Lib-Dems in Edinburgh are metaphorically "out to lunch". ... mind you - I feel like I know most of these streets pretty well already! ... but I've also, very recently, made clear my disdain at the lack of political leadership from the current Council Coalition on the project. Well, today, I think that lack of clear leadership has become all too apparent to thousands and thousands of commuters - it's the first day 'The Mound' junction has been closed and by all accounts it is causing complete gridlock within the City Centre. I know that some problems are to be expected, but the scale of what's happened this morning strongly suggests to me that the changes just have not been explained, publicised or communicated effectively. Transport Officers cannot do that job alone - they need senior political figures to get their heads above the parapet and start 'championing' the project from the front! Can you tell me the last time you saw such a politician on TV, or heard them on radio, explaining what was about to happen?? Everything (politically) appears to be reactive and not proactive - and all (political) energies are used up with the in-fighting between the Coalition partners who disagree on this project.